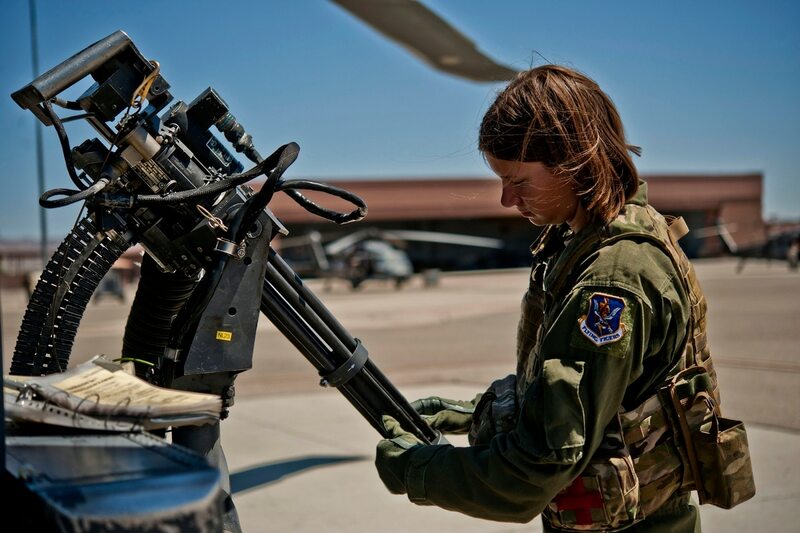 The first female Tactical Air Control Party airman could potentially be trained and assigned to an operational unit this year, the Air Force said in its formal plan for integrating women into the last six male-only combat jobs. But it could take years before the other five previously male-only combat jobs could begin fielding women, the Air Force said in its women in combat integration plan, which the Pentagon released Thursday. Defense Secretary Ash Carter on Dec. 3 announced his decision to open to women all restricted jobs across the military, including six Air Force specialty codes covering 4,099 positions: 13C special tactics officers, 13D combat rescue officers, 1C2XX combat controllers, 1C4XX Tactical Air Control Party (TACP) airmen, 1T2XX pararescuemen, and 1W0X2 special operations weather enlisted airmen. Air Force Secretary Deborah Lee James on Dec. 29 submitted her service's implementation plan to Carter. And in it, the Air Force expressed its determination to follow through on opening all jobs to women. "The success of gender integration will take time and requires a focus on standards, policy, education and engaged leadership at all levels across the total force," the plan said. The plan said women will be assigned to these jobs in accordance with the Air Force's standard assignment process, but that female TACPs could be assigned to units in calendar year 2016. The other battlefield jobs take two or more years to train for, meaning it will take longer for women to be assigned there. And the Air Force insisted its standards will not slip as it integrates the last six jobs. "There will be no quotas, critical mass or special preferences based on gender," the plan said. "The Air Force has not changed, raised or lowered standards as part of opening up our battlefield airmen career fields to women. The mental and physical standards in place prior to opening to women will be the exact same standards in place and in use after we open the career fields to women. Any airman or recruit wishing to enter these [battlefield airman] career fields (regardless of gender) will be accessed and qualified using the currently validated standards." The Air Force last year developed gender-neutral occupational standards for these battlefield jobs, and linked those standards to specific tasks airmen would be expected to be able to do in combat, such as climbing a rope ladder in full gear or carrying a wounded comrade across the battlefield. The plan spells out several tactics the Air Force plans to use to ease the integration of women into these jobs. For example, other services have had success by having senior female service members present when junior female service members enter a unit. And when possible, the plan said, the Air Force wants to have a combination of senior female airmen with junior female airmen during technical training — although the Air Force said it won't delay junior women's training if no senior women are available. But the plan identifies several potential bumps, both major and bureaucratic, that will need to be overcome. For example, Army and Marine Corps studies have found that women are injured more frequently than men when engaged in ground combat training, the plan said — especially in "load-bearing" jobs. The Air Force said it must learn from the Army and Marine Corps' experience and adopt methods to prevent such injuries while not compromising the training or the operational mission. To cut down on such injuries, the plan suggested training and operational units have on-site physical therapy and individualized athletic training, which could increase airmen's resiliency. "Preventive medicine assets are key to the data collection of injuries and illnesses and analysis of this data to develop operationally relevant preventive strategies to reduce occurrences" of injuries, the plan said. Integrating women into these male-only jobs will also present a cultural shift, the plan said. And any concerns about the loss of combat effectiveness can be addressed by strong leadership and adherence to the newly-developed gender-neutral standards, the Air Force said. "Sexual assault or harassment, hazing, and unprofessional behaviors are never acceptable," the plan said. "Our core beliefs in good order, discipline, leadership and accountability are foundational to our success in gender integration." But at the same time, the plan said, some allies may be culturally opposed to working with women and gender integration can complicate cooperation with those partners. The military has dealt with these issues in Iraq and Afghanistan, the plan said, and the Air Force should learn from those lessons when integrating combat units. Recruiting is another area that could prove to be difficult. "Recruiting will be a challenge since there will be tremendous competition for the limited cohort of qualified volunteers amongst the services and other government or private agencies," the plan said. "In addition, the reserve component is faced with unique restrictions based on need to recruit locally, further reducing the pool of qualified members to fill unit vacancies." The Air Force also said it would start advertising and recruiting women into these newly-opened battlefield airmen jobs Jan. 4, and update officer and enlisted classification guides to reflect they are now open to women. And the Air Force will use its Physical Ability Stamina Test to see whether potential recruits can make it into the battlefield airmen career fields. New female recruits with no prior service who hope to join a combat career field must go through the Air Force Special Operations/Combat Support Candidate Development Support Services — also known as the "Scout/Recruit/Develop" program — before entering basic military and technical training. Female air liaison officers are already going through TACP training without any problems, the Air Force said. New recruits joining the other battlefield jobs can begin going through Scout/Recruit/Develop program as early as July 1. The Air Force said the July 1 date will mean more non-commissioned officers will have a chance to enter the training pipeline with junior enlisted airmen, which it hopes will ease concerns about gender integration. It will also allow more time for the training program to prepare for gender integration, and allow women more time to prepare for training. Air Force career field managers, leaders and recruiters are also going to start to look for current airmen, and former airmen with prior service, both male and female, who are interested in serving in one of these newly-opened combat jobs, the plan said. Anyone who is interested in cross-training into those jobs will be contacted and provided information on potential career paths and how retraining would work.